Here, you’ll discover the types of dental issues which can crop up during pregnancy and how you can deal with them. The first thing you really need to do, is to let your dentist know that you’re pregnant. You’ll need to tell them how far along you are, and whether you’re taking any medications. If your pregnancy is classed as high risk, or you’re on specific medications, your dentist may need to postpone various types of treatments. Letting them know what medications you’re taking will also help the dentist to determine which prescriptions they can safely prescribe you if needed. They’ll also be able to consult with your doctor to choose the best antibiotics and pain-relieving medication. Being pregnant does put you at a higher risk of cavities and tooth decay. This is down to a number of factors. Firstly, if you’re consuming more carbohydrates, it can lead to tooth decay. Suffering with morning sickness can also pose a risk of tooth decay due to the increased amount of acid in the mouth. The best way to reduce your risk, is to maintain a strict dental hygiene routine. Floss frequently and ensure you’re brushing your teeth twice each day. Another issue you’re at risk of developing, is pregnancy gingivitis. This, like so many other things in your life, occurs due to hormonal changes you experience in pregnancy. The increase in hormones can lead to the gums swelling up, or at the very least, becoming tender. You may also experience bleeding gums too. If you don’t treat the condition, it can go on to develop into a more serious form of tooth decay. Therefore, you should always seek advice from your dentist if you think you’re suffering with pregnancy gingivitis. Finally, there’s also the possibility you could develop pregnancy gum tumors. These tend to largely occur during the second trimester, and they’re basically tissue overgrowths. They’re not cancerous, and they generally lead to swelling in between the teeth. You may also notice your gums bleed when you brush them. These tumors will usually disappear on their own after the pregnancy. However, you can always talk to your doctor or dentist if you are concerned about them. Is It Safe To Have Dental Work Carried Out In Pregnancy? If you need to have work done on your teeth or gums, it’s understandable you may be worried about the effect it could have on your baby. However, the good news is that the local anesthetic used during dental work is generally safe for you and baby. There have actually been studies carried out and published within the Journal of the American Dental Association, which show the local anesthetic used in dental procedures is perfectly safe during pregnancy. They followed numerous pregnant women who underwent different procedures and no increased rates of miscarriage, premature birth or birth defects were recorded. However, if you are concerned, your dentist will be able to determine whether the treatments should be postponed or whether it’s safe to go ahead. It’s worth noting that most dentists will postpone non-urgent dental work until after the pregnancy. 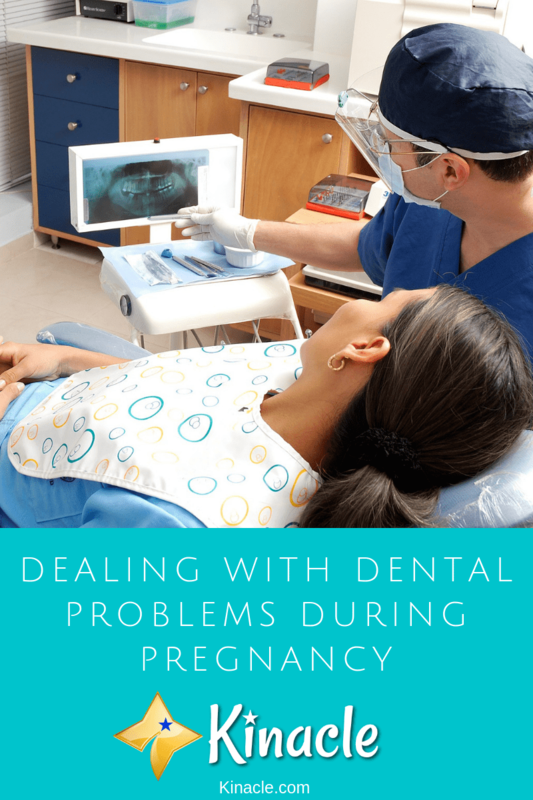 So, unless there’s a risk the dental problem could get much worse before you give birth, you may not need to undergo any treatments throughout the pregnancy. X-rays are another thing you may be understandably worried about. However, like local anesthetic, dental x-rays are generally safe for pregnant women. The level of radiation used during an x-ray at the dentist is extremely low. You’ll also be given a leaded apron to wear in order to further protect your baby. Your throat should also be covered with a leaded collar to protect the thyroid against potential radiation damage. So, generally speaking, dental x-rays are safe to undergo when you’re pregnant, but again your dentist will be able to give you the best advice on whether it’s safe to go ahead. As mentioned earlier, morning sickness can lead to problems with tooth decay. This is because when you vomit, you bring up strong stomach acid which can linger in the mouth. If left, it can really start to wear away at your teeth. There’s also the fact that morning sickness can actually prevent you from brushing your teeth if your toothpaste makes you feel nauseous. To prevent morning sickness from causing havoc on your gums and teeth, there are a couple of things you can do. If the problem is that your current toothpaste makes you want to vomit, it’s worth switching to a milder one. It’s a good idea to ask your dentist or doctor for their recommendations as they’ll know which toothpastes are best to use during pregnancy. Making sure you properly rinse your mouth out after being sick and brushing your teeth more frequently, will also help to prevent acid buildup. As you can see, there’s a few dental issues which can crop up when you’re pregnant. However, by visiting the dentist regularly, letting them know you’re pregnant and increasing your mouth hygiene routine, it’s possible to prevent and effectively treat the issues above. Treatments have come a long way, so you no longer need to worry about whether a trip to the dentist is bad for you and baby.